Rocket Theatre is able to offer some of its highly acclaimed theatre shows for private performances throughout the UK. By re-working some of our most recent productions, shows can now also be performed in restaurants, hotels, church halls, private members clubs or even a room in your very own home! We do not need a stage or any special lighting or set as we perform the show literally amongst your guests. The audience can be seated at tables (cabaret style) or on sofas and chairs – depending on what suits your venue. A gripping tale of love, honour, duty, fortune-telling and murder! This hilarious retelling of the classic story revels in the wit of Wilde, while borrowing (rather cheekily) from Wodehouse, to create a wicked black comedy that positively fizzes with fun. 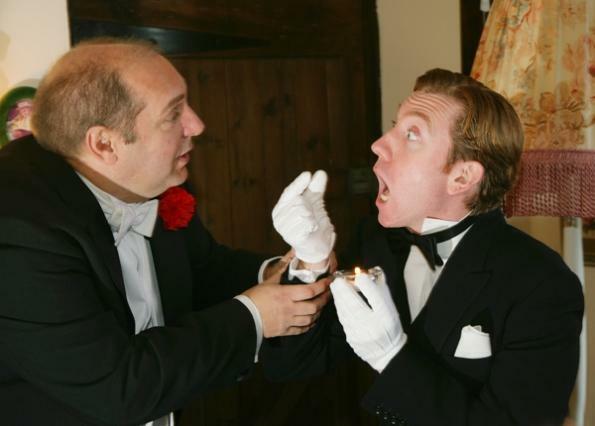 Join Lord Arthur and his versatile valet, Middlewick, for an evening of ludicrous indulgence. Dare you spend time in the company of Lord Arthur Savile? This show has received excellent reviews when performed in theatres and can run at its original 90 minutes but we have also created a 60 minute version which may suit your event better. It can be played with or without an interval and can be performed between courses of a meal if required. The show is extremely flexible so why not talk to us about your plans and how best to bring unique entertainment to your guests. Contact details are below.